Why should I care about UX? How do I "do" user experience? "Ideation is about generating ideas and making them tangible." Get all those crazy ideas out of your head and on paper. Carry a notebook. Have a brainstorming session with lots and lots of post-its. Leave your inner censor outside the room. 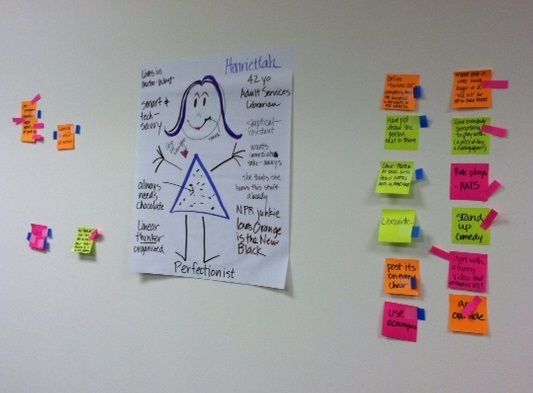 Try creating personas based on your knowledge of who uses (or doesn't use) your services. Think about what they might want from the library. Let's say you're trying to increase reference transactions. Based on a survey and some impromptu patron interviews, you discover people want to ask questions on social media. Fire up Twitter or Facebook, or wherever else your patrons might be hanging these days, and give it a shot! Or maybe you're hoping to increase program attendance and patrons have suggested they never notice your promotional materials on community bulletin boards. You might try your hand at revamping the design of your flyers, or getting the word out through channels your patrons have told you they're likely to check. For a website redesign, this could be monitoring page views or tracking whether program attendance goes up after highlighting your event calendar on your homepage. For signage or a new furniture arrangement, this could take you back to the observation stage. How people are reacting to the changes? Do they seem more comfortable? Less confused about which way to turn down the hallway? If you're trying to make a service desk more inviting, have staff members keep track of how many times an interaction begins with hesitation or an apology (like "I'm not sure if I'm in the right place, but..."). Don't forget to ask for patron feedback when you can, whether it be conversationally or through a survey or comment box. Going both ways is best - you might find people are more forthcoming when they have a chance to put their thoughts in writing.